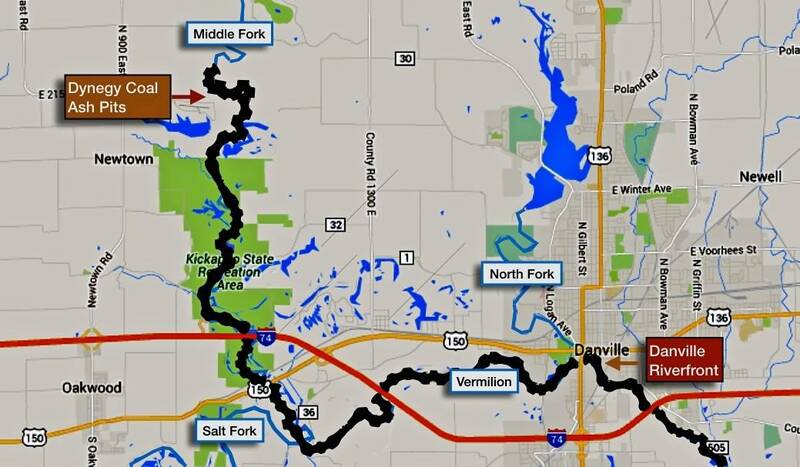 The Middle Fork of the Vermilion River is a swift-running stream that freely meanders from the north to the south through the Middle Fork State Fish and Wildlife Area, Kennewick County Park, and Kickapoo State Park in nearby Vermilion County. If you are among those who have paddled, fished, or hiked along the Middle Fork, you know why advocates worked so hard to have it designated both a State and National Scenic River nearly 30 years ago. The river is known for its clear-running waters; high, sandstone bluffs; gravel bottom, punctuated by large boulders and rocks; and a changing gradient with riffles that make it a fun river to run in a kayak or canoe. Together, the Middle Fork and surrounding open space corridor support 57 types of fish; 45 different mammals; and 190 kinds of birds. Twenty-four species are officially identified as threatened or endangered. But the state’s only National Scenic River also is home to the now-shuttered Vermilion Power Station and 3.3 million cubic yards of coal ash. This coal-fired power plant, now owned by Dynegy Midwest Generation, overlooks the river from its west bank, about 12 miles upstream from Danville. Over 55 years, Dynegy and its predecessors dumped 3.3 million cubic yards of toxic coal ash into three pits constructed in the river’s floodplain. That is enough material to cover over 1547 NFL football fields with one foot of ash, or fill the Willis (Sears) tower nearly two times! Coal ash is the waste that is left over after burning coal to generate electricity. It contains toxic metals such as lead, mercury, arsenic, cadmium, chromium and selenium, which are known to cause birth defects, cancer and neurological damage in humans and wildlife. If Dynegy has its way, the Illinois Environmental Protection Agency (IEPA) will approve a plan that will permanently leave the waste in its current location. 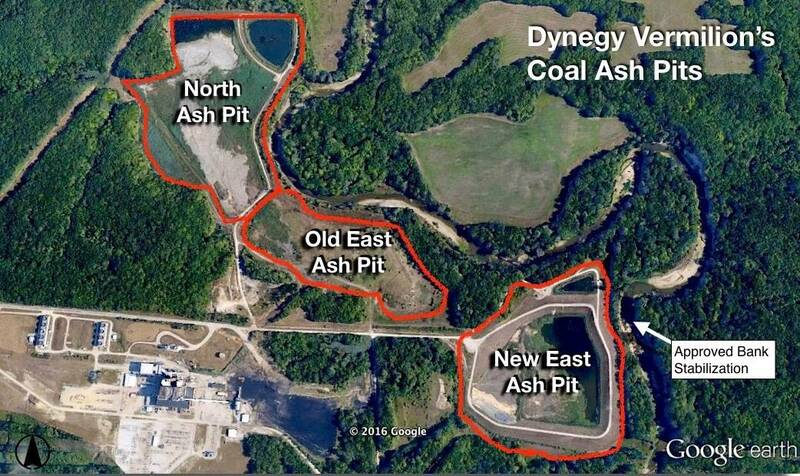 Eco-Justice Collaborative and Prairie Rivers Network are working on a coordinated campaign calling for the IEPA to require Dynegy to move its coal ash out of the floodplain to a properly-constructed, lined facility on its property, away from the river. The Old East Pit and North Ash pit are unlined and leaking toxic metals into the groundwater and the river. Class I groundwater quality standards have been exceeded for boron, iron, manganese, sulfate, total dissolved solids, pH and arsenic. The New East Pit is lined, but was constructed over mine voids, raising concerns over its long-term stability. Most importantly, the meandering river has seriously eroded riverbanks next to these three pits, moving the channel closer and closer to the walls of the impoundments that hold back the toxic waste. In fact, the river has so severely eroded the banks of the newest coal ash pit that Dynegy recently received approval from state and federal agencies to install emergency stream bank stabilization for a distance of 485 feet. Work along the riverbank abutting the New East Ash Pit is underway, but according to information obtained via the Freedom of Information Act, just 10 feet separated the river from the toe of the coal ash embankment at one location. 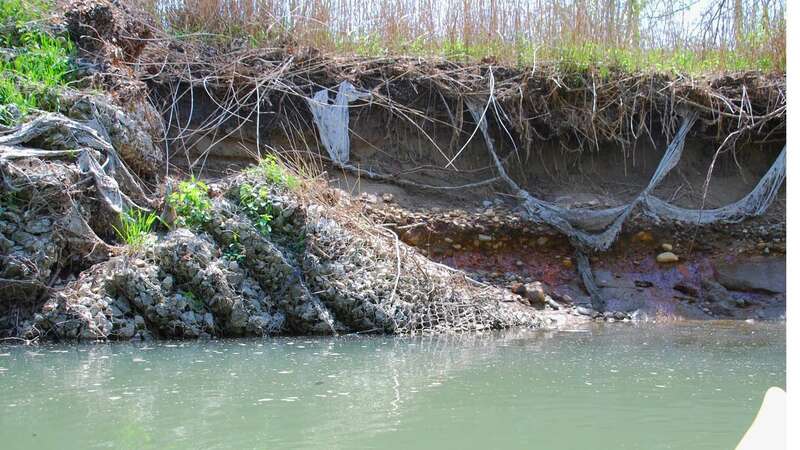 Although Dynegy is currently working to reinforce banks abutting the New East Ash Pit, gabions (wire cages with rock) installed in the early 1980’s along the Old East and North Ash Pits are deteriorating and literally falling into the river. This leaves banks that abut these two coal ash pits vulnerable for a distance of nearly 1/2 mile. At this time, there are no proposals from Dynegy to repair or replace failed stream bank protection measures along the two oldest pits. A breach of just one of these pits could send millions of cubic yards of toxic ash down the river, much like the 2008 catastrophe in Tennessee, where a dam at TVA’s Kingston Fossil Plant near Harriman TN failed, and 5.4 million cubic yards of coal ash cascaded into the Emory and Clinch Rivers. The breach released a slow-moving wave of toxic sludge into the rivers that smothered about 300 acres of land, snapping trees as if they were twigs and knocking homes off their foundations. More recently, a pipe ruptured under a coal ash pit at a Duke Energy Power Plant near Eden, North Carolina, in 2014, sending 46,000 cubic yards of toxic waste into the Dan River. And just last month, flooding associated with Hurricane Matthew caused a coal ash spill from a pit associated with Duke Energy’s H.F. Lee Power Plant near Goldsboro, North Carolina, releasing coal ash into the Neuse River. Investigations are underway to determine the extent of the damage. This toxic waste poses a long-term threat to the river, to the people who depend on it, and to the recreational and economic values that it provides to the region. 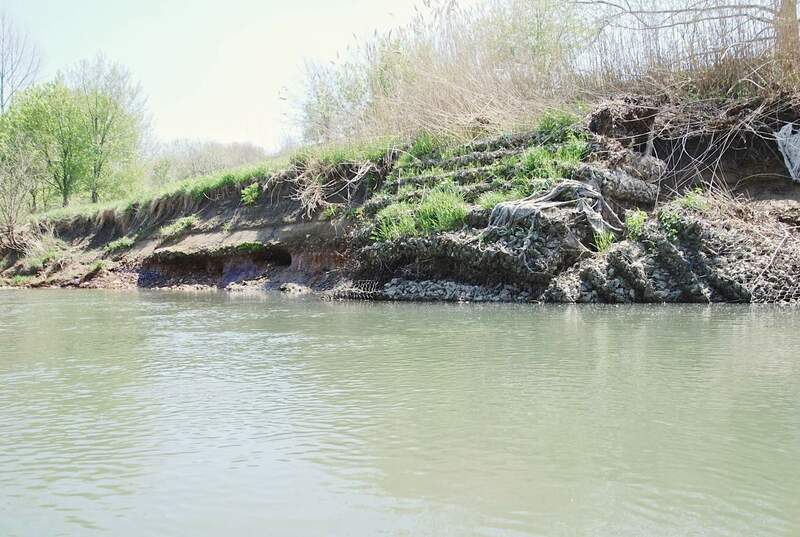 A spill on the Middle Fork could leave massive cleanup costs to taxpayers, and Illinois’ only National Scenic River and adjacent wildlife and recreation areas would be devastated. Vermilion County and the City of Danville plan to capitalize on the scenic and recreational potential of the river and its economic potential for tourism. More than one million people visit the area each year, providing much-needed opportunities for a region that has experienced de-industrialization and out-migration over the years. The National Park Service has repeatedly called on Dynegy to move its coal ash out of the floodplain, citing that the presence of this toxic waste is inconsistent with the purpose and intent of a National Scenic River. But Dynegy, whose 2015 gross profits exceeded $1.8 billion, has dismissed the option of removing the coal ash from the floodplain, citing “unfavorable costs.” Instead, the power company has proposed closing the ponds by leaving them in the floodplain and capping them with a PVC liner and 36 inches of dirt. This is the plan that has been submitted to the Illinois EPA for approval. But even Dynegy admits in its own reports that the coal ash pits could eventually fail. Their “cap and leave” proposal is a short-term solution that will put the liability for this dangerous site directly into the hands of future generations. Go to https://ecojusticecollaborative.org and click TAKE ACTION to send a letter to Governor Rauner and IEPA Director Alec Messina that asks them to protect the Middle Fork River and the people of Vermilion County. Tell them you oppose any decision that allows Dynegy to leave its toxic waste in the floodplain, because it would put the river at risk and destroy the resource upon which Vermilion County and the City of Danville are building their future. Also, leaving the pits in place will mean state and county taxpayers will shoulder costs associated with future maintenance, repair, and potential cleanup. Don’t wait. Do this today!